SANTA MONICA — The 2018 Santa Monica Reads community reading program continues as Koji Steven Sakai, Phinneas Kiyomura and Rob Sato, creators of the digital graphic novel “442,” present “The Story of the 442nd Regiment in WWII” on Saturday, June 2, at 2 p.m. in the Main Library’s Martin Luther King, Jr. Auditorium, 601 Santa Monica Blvd. 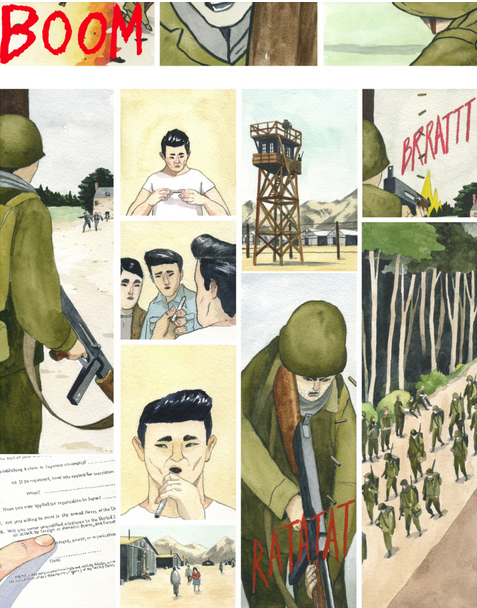 Southern California-based graphic novel creators Sakai, Kiyomura and Sato present an illustrated talk about the 442nd Regimental Combat Team, the U.S. Army’s Japanese American unit in Europe. The Nisei soldiers risked their lives behind enemy lines, even as their families were behind barbed wire in camps back home. The 442nd remains the most highly decorated unit for its size and length of service in the history of American warfare. The presenters will share family stories and striking visuals. The digital graphic novel is available for free on the Stela app. Kiyomura is a playwright, actor and former skate punk from Long Beach. His critically acclaimed plays (“Lydia in Bed,” “Figure 8,” and “Woods”) have been produced at Theatre of NOTE, Padua Playwrights and Sacred Fools. His father was incarcerated at the Rohwer Relocation Center in Arkansas. Sato is an artist, illustrator and paper sculptor whose work has been featured in **Giant Robot Magazine, Hi-Fructose, Juxtapoz Art & Culture**, and **New American Paintings. ** His grandfather was interned in the Jerome and Rohwer camps in Arkansas and served in the 442nd. This presentation is part of the Santa Monica Public Library’s 2018 Santa Monica Reads program. Now in its 16th year, Santa Monica Reads is a community reading initiative that encourages all residents and visitors to read and discuss the same title in book discussions and special events held throughout the city. This year’s selection is “Farewell to Manzanar,” the classic memoir by Jeanne Wakatsuki Houston and James D. Houston, which chronicles young Jeanne’s experience with her family before, during and after camp. This program is free and open to all ages. Seating is limited and on a first-arrival basis. The Santa Monica Public Library is wheelchair-accessible. The Main Library is directly served by Big Blue Bus Lines 1, R10 and 18. The Expo Line and Big Blue Bus Lines 2, 3, R3 and 9 stop nearby. Bicycle parking racks are available at the library. For more information, call (310) 458-8600 or visit http://smpl.org/SMReads.aspx.